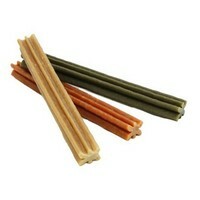 Whimzees Stix Dog Chews are a completely edible dog chew made out of 100% natural compounded vegetable fibres. Created in a delightful textured shape with a unique vegetable based surface texture, the chews will stimulate the blood flow in your dog’s gums, while also preventing bad breath and removing plaque and tartar from their teeth as they chew. Free from gluten, sugar and artificial flavours, Whimzees Stix also contains malt extract and yeast that helps to improve metabolism and muscle tone, while promoting strong bones and a healthy, shiny coat. Please Note: Colours may vary between green, brown and tan which cannot be guaranteed when ordering. Good product. No mess and lasted slightly longer than a denta stick does. Dogs enjoyed them. Will definitely buy these again. Great product. My cairn terrier Katie loves the. Excellent service. Ordered Tues 8 May and received them the following day. Thanks. I thought These chews would be a bit to hard for my Westie and Jackapoo, They weren't around long, My dogs demolished them easily. Our border collie doesn't really do "chews" but I had been giving him two at a time of the small Whimzees which he ate so fast it worried me so I've been trying him on the large ones which work really well as a "proper" chew in that he lies down and chews through them until he's finished them. So I'm delighted to have found a chew that he likes at last! These Whimzees Stix are fantastic if our yellow lab's excitement is an indication. They don't have the awful smell that a popular brand found in the supermarket does, so it's also a plus for us. They are firm and seem to give a good chew as Chyanne won't stop until it's gone. We go for the small size as she gets more than one a day as hubby can't resist the 'pretty please' look. But wish there was a size between small and medium as medium I'd really too big for her and small is a little too small. But these are now to be purchased with every Vetuk order. both my cocker spaniels enjoy these, the small size is fine for them I am not keen on the green colour it just looks yucky, but the dogs don't care! Good for both my dogs - one puts on weight easily and one has delicate digestion as well as a few missing teeth, but she can manage these. Difficult to know which size to buy though as the small are a bit too small but medium is too big!